Get ready for a romp around Mackinac Island! 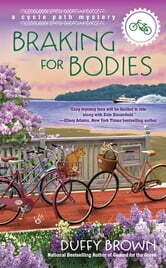 Where there's a Lilac Festival and Evie Bloomfield and her dark cloud, there's bound to be fun...and trouble. While trying to take care of her maid-of-honor duties to a quickly falling apart wedding, Evie must try to find a killer and prove to Chief Sutter that her best friend, Fiona, is innocent. Fiona's old boss from LA has shown up with his secretary, and mistress, Zo, followed closely by his angry wife, Madonna. He's not on the island a full day, when poor Evie finds him dead - with Fiona hovering close by. To keep the tourists from mass-exiting the island, Evie talks Sutter into letting everyone believe that it is a Mystery Game, and everyone involved are actors - not a real murder. The Grand Hotel gets into the fun, offering the winning team who figures out the Mystery, a free weekend at the Grand. 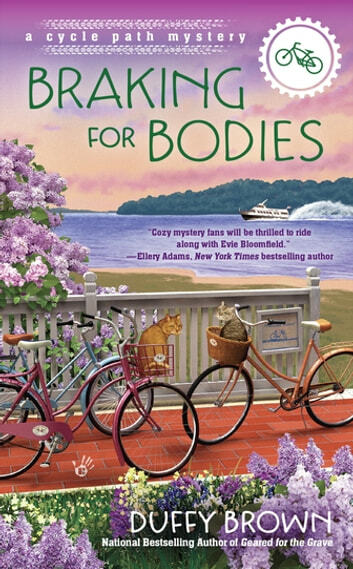 Duffy Brown takes you on a fun ride, on a bicycle of course (and sometimes "borrowed" horse) around Mackinac, trying to figure out just who "done it". There are too many possibilities and not enough real clues. Is the wife or the mistress? They have alibis. Is the check-in clerk and hotel manager? They've got something going on. Is it Fiona and her singer friend, Idle Summers? Peep had something on both of them. You're gonna have to read to the very end to find out! And you won't be able to put it down until the end!! Cozy about bicycle shop owner on Mackinaw Island, Michigan. This is the 2nd book in the series I've read. The first one was 2 years ago and I had hoped that the dialogue would be more mature but afraid not. The writing is really very clever and "cute," but that's the problem for me. It's TOO clever and cute. I know what a cozy is, but am also interested in a serious look at the crime. The ending was a little unusual but I just had to skim through all the silly sit-com type parts.